Just the other day Ken and I commented that it was seventeen years ago this month that he and I decided to start a business in Nicaragua. Looking back we noticed in old photographs our dark brown hair and young looking skin, not to mention the excitement on our faces and the desire to create jobs. Time certainly does fly by fast, and as my father often reminded me… “the one constant we all face during our time here is change!” He had a crazy way of saying things but the older I get the more clear his observations were. Today’s Nicaragua is very different than when we first visited, and it has been an amazing journey to watch and be a part of (no matter how small our contribution). Like any developing and transitioning nation, there always seem to be a three-steps-forward, followed by a two-steps-back process! Nicaragua’s recent uprising over Social Security Reform morphed from peaceful protesting by many, to organized riots by those that despise the current Ortega model. It was particularly inspiring for us to see that while many aspects of life there have changed for the better, the everyday man and woman on the street still expects more from their elected officials and will stand up and demand change. We love Nicaragua, and while the current situation will take a good while to develop, we’re confident that more positive change is in her future and continued long-term economic growth and prosperity will follow. Over the past 24-months I have traveled extensively to several other Central American countries (Panama, Costa Rica, Guatemala, Ecuador, Belize) seeking opportunities to expand our footprint. I have plans to head to Colombia this year too to check in on a variety of interesting possibilities there in the agricultural space. Our recent partnership with The Rainforest Alliance is opening many doors for us, and we’re taking the necessary time to study and evaluate a myriad of alternatives that will help us grow and expand throughout the region. During the last three months I have visited cattle ranches that operate interesting and unique models that are attractive short-term plays. I toured the world’s largest managed forest and witnessed an inter-cropped short-leaf palm business that supplies churches and the floral industry internationally. In Peten, Guatemala, I met a tremendous team operating a medium-sized (but very successful) Papaya farm that exports to the USA and who are seeking a strategic partner to help them fill a five-fold increase in interest from the buyer. There were many, many other opportunities that made my top ten list, including White Cacao, Pineapple, Ramón Nut, Papaya and Cattle. We are currently negotiating with several of the groups that we feel are the finest at what they do and that fit our impact investment philosophy. I am more excited today than at any other time in our history. With the growing number of partnerships we have established, as well as those we’re consistently asked to consider and be a part of, combined with greater scrutiny and interest from Sovereign Wealth Funds, NGO’s, Family Offices, etc., the foreseeable future will certainly expand our reach and open up opportunities for mid-stream and down-stream supply chain relationships. There’s a lot of people that need our support on the grow side, and billions more who will be moving upward and seeking higher quality nutrition. The AG space has a bright future, and those of us who understand and participate here stand to make a positive impact both financially, socially, and environmentally. 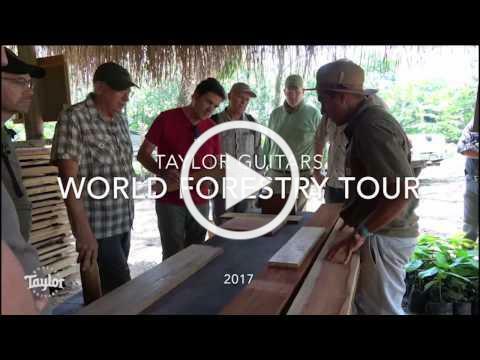 View the video below (and others in the series) of Taylor Guitars from their World Forestry Tour in 2017. Our partners in Guatemala work with both Taylor and Gibson Guitars as well as several other global brands from a variety of industries. I look forward to our continued relationships and thank you for doing business with us.